SERGIEV POSAD, July 18. /ITAR-TASS/. Russian President Vladimir Putin hopes that the Orthodox Church will make its contribution to establishing peace in the Middle East. Putin, who met representatives of local Orthodox Churches at the Holy Trinity — St. Sergius Monastery on Friday, wished Metropolitan Timothy of Vostra, the Patriarchate of Jerusalem, success in serving in a unique place like Jerusalem, the cradle of Christianity. Regrettably, the president said, the Middle East had been torn by various conflicts for many years. “Today, we can see a new conflict flaring up there again — with bloodshed and human casualties. We are anxiously watching what’s going on (in the Middle East),” the Russian leader went on to say. “But I am sure that the presence of the Orthodox Church will play a positive role in reconciling the warring parties,” the president stressed. “In the end, everybody comes to peace. Only, it is important to make this road as short as possible and avoid inflicting huge casualties on the way to peace,” Putin said. He also urged Patriarch of Moscow and All Russia Kirill to make a strong contribution to pacifying the warring parties in Ukraine. “I think that all of us should be out to achieve this goal. 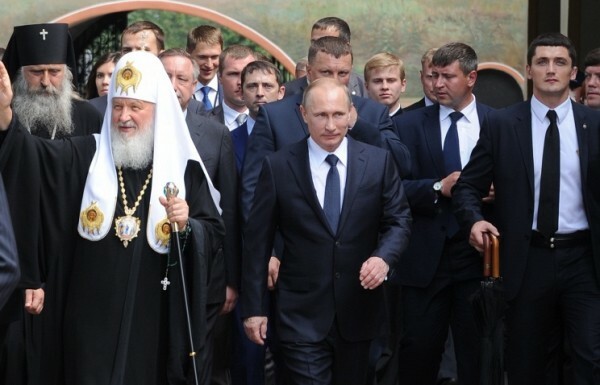 I am going to ask the patriarch to make his strong contribution to this pacification,” Putin said. “We believe that peace should come to the land of Ukraine as soon as possible. All the warring parties should establish direct contacts with each other as soon as possible,” the president emphasized, adding that all the parties in conflict should immediately stop military hostilities and sit down to peaceful talks. Putin also said that the people of Russia were watching the events in Eastern Ukraine with anxiety and grief. “This just is terrible. It is a tragedy,” the president stressed.